I have been trying to understand what it is like to be a member of a minority faith in relation to the majority faith. Here Christians are a double minority—both among Jews and Muslims. Muslims are the majority in the Palestinian context, they in turn are the minority in the Israeli context (about 30%). By comparison, the Muslim population of the UK is reported to be about 4%. What one feels keenly as a small minority is the barriers that communities raise between each other. 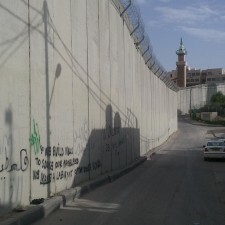 In this, my last blog from Jerusalem, I consider the walls that are built by the various communities. The most obvious wall here, impossible to ignore, is the barrier built by the Israelis between Israel and the Palestinian Territories, but there are other walls, or barriers, that are not as visible or easily detectable, and which are just as impermeable.